This is a common scenario: You are video calling a Govt. representative or HR from a company for conducting the interview. The other party asks for a document, which you can send with a click of a button. But, you are skeptical regarding sharing the document, as you feel that the other person is not genuine. How can you be assured that sharing sensitive documents with that person is safe? Skype has clearly understood this problem, as they have launched the much-hyped Aadhaar verification module into their Skype Lite version. But, will it stop impersonation frauds? In the month of February, Skype had introduced Skype Lite, designed and optimised for low-processing power Android smartphones. They had demonstrated how they will secure video calls on Skype Lite, using Aadhaar protection. Now, this feature has been officially launched in the updated version of Skype Lite. Note here, that last year, Govt. had started pushing companies like Google, Microsoft, Apple to implement Aadhaar based security mechanism. This may be the reason for Skype Lite’s initiative using Aadhaar database. During a video call on Skype Lite, any person can ask for an Aadhaar verification of the other person. When such a request is prompted, by clicking “Verify Aadhaar identity”, the other person would be required to enter their 12-digit Aadhaar number in a new pop-up. Once that is done, Skype will check the Aadhaar number with the UIDAI database, and authenticate with an SMS based OTP. If this authentication is successful, then the call can resume, else the call would be disconnected. Few details of the entered Aadhaar data, such as name, last 4 digits are stored, which can be instantly used to re-validate authentication, next time, with another person. Now, a doubt may persist whether Skype and Microsoft (which owns Skype) will store any information or not? Will It Stop Impersonation Fraud? As per some analysts, the biometric scan of Aadhaar verification is a solid way of stopping such frauds. However, this facility is not currently available on Skype Lite, which makes the whole concept of Aadhaar based security somewhat weak. Besides, as Medianama pointed out, GSM sniffers can very well extract OTPs as well, because mobile communications in India is not encrypted. If the mobile phone on which Skype Lite is installed is stolen, then it will become even more simple for the thieves/hackers to misuse it. 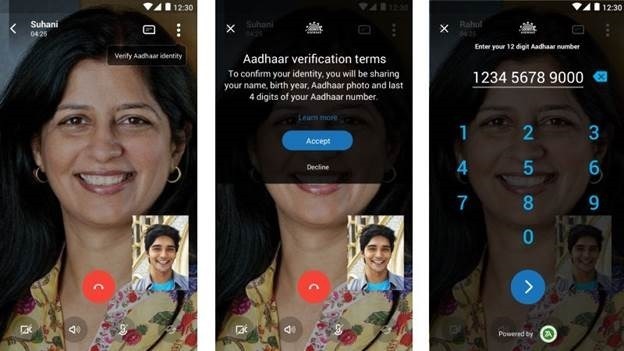 But apprehensions and doubts aside, the concept of Aadhaar based Skype video call sounds like a solid beginning for a secure communication medium. Maybe this will act as a base for further improvements. Do share your opinion on Aadhaar based Skype calls, right here. The quality of article is terrible. Your source of GSM infrastructure is Medianama, congrats!! Only 2G is vulnerable to sniffers. Do your research.